There’s a cold, hard fact that a majority of us MBAs don’t learn in business school and it’s the reality that companies falter and fail quite badly, quite often. Theoretically, a company’s competitive advantage should strengthen its positioning and it’s ability to succeed among competitors. This, we MBAs are told, is done by using Michael Porter’s five-force model as a barometer of sorts. A Harvard University business professor, Porter developed the model to determine competitive intensity and the attractiveness of a business market based on five, driving forces that he identified as: the threat of new competition, the threat of substitute products or services, the bargaining power of customers, the bargaining power of suppliers, and the intensity of competition among rivals. A company’s ability to succeed in the ever-changing market should be always be within grasp, business schools commonly say. Systems thinker Jamshid Gharajedaghi would disagree with that premise. A managing partner at the Interact Institute for Interactive Management, Gharajedaghi asserts that five, specific forces turn a company’s success into failure. They are depicted by his five-level hierarchy model, which is this post’s accompanying graphic. The forces that sabotage success, according to Gharajedaghi, are: imitation, inertia, suboptimization, change of game, and shift of paradigm. Gharajedaghi’s five forces almost seem pitted against Porter’s five forces. For each force Porter proposed as a determinant of success, Gharajedaghi offers a counter-force that erodes it. Porter’s threat of new competition force posits that the more profitable a market is, the more attractive it is to new companies that want to jump in and reap the rewards. Creating barriers of entry, like making the entry costs extremely high, is the only way existing companies can stop the inflow of new, resource-strapped companies. Despite the barriers, blocking new competitors can’t thwart their attempts at imitation, which Gharajedaghi called the most basic of the forces that hinder success. Just look at Apple Inc.
A decade ago, the iPod was a revolutionary gadget that capitalized on the growing popularity of the MP3. The small, pricey gadget locked the cassette-playing walkman and portable CD player inside a time capsule forever. Within a few years, several companies started cranking out generic MP3 players that served the same purpose as an iPod and were much more affordable. By the time the market had grown saturated with iPod knockoffs, Apple skimmed past the full-effect of Porter’s threat of substitute products or services force by introducing the iPhone in 2007. The release of this product also helped the company proactively dodge Gharajedaghi’s counter-force of inertia, which tends to set in when success with a particular technology makes a company resistant to changing or reinventing it. Porter’s force concerning the bargaining power of suppliers is juxtaposed by Gharajedaghi’s force of suboptimization. As company’s fight to make products cheaper, faster, and better, they urge their suppliers to follow suit. This leads to a pattern of exaggeration that Gharajedaghi described as “the fallacy that if ‘X’ is good more ‘X’ is even better.” Under this assumption, suboptimization occurs as the “tendency to push one’s strength to its limits transforms the strength into a destructive weakness,” according to Gharajedaghi. This perfectionism doesn’t just affect the company. I would argue that it ripples out to those who assist the company until things spiral into chaos, oblivion, or both. Citing The Icarus Paradox by Danny Miller, Gharajedaghi noted how “craftsmanship and productive attention to detail by the Digital Equipment Corporation turned into an obsession with minutia and technical detail” some years ago. “Exaggeration was also at work,” Gharajedaghi wrote, “when the innovative capability of CDC and Polaroid escalated into high-tech escapism and technical utopia.” IBM, Texas Instruments, General Motors, Sears, and Apple are among the companies who’ve also resorted to suboptimization in their fight for success, according to Gharajedaghi. When a company fails to appreciate the implication of its success and the need to play a “new game” that evolves from that success, the company lapses into “a counterintuitive process that converts success into failure,” according to Gharajedaghi. This propensity is most felt when it clashes against Porter’s force concerning the bargaining power of the customers, which asserts that customers can pressure or affect a company through specific measures, such as price sensitivity and demand for products. As competition among rivals intensifies, Porter’s model asserts that companies focus on developing a sustainable competitive advantage by, for example, enhancing innovation and developing a powerful competitive strategy. 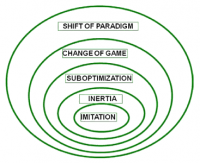 This may sound pretty straightforward but, at this stage of the game, it’s quite possible that Gharajedaghi’s forces of imitation, inertia, suboptimization, and change of the game have already set in, which makes black-and-white strategy crafting quite gray. Based on Gharajedaghi’s writings, I would assert that in the face of stiff competition, a company needs to shift the paradigm—Gharajedaghi’s fifth, final, and all-encompasing force in his hierarchical model. “Faced with a series of contradictions that can no longer be ignored or denied and/or an increasing number of dilemmas for which prevailing mental models can no longer provide convincing explanations,” Gharajedaghi wrote, when it’s time to try something different, “most people accept that the prevailing paradigm has ceased to be valid and that it has exhausted its potential capacity.” The same thing happens to companies. Need an example? Try Eastman Kodak, a company that stuck to the same formula for several decades and died a slow, painful death with stock that, in its final days, sold at a few cents per share. Need another example? Try newspapers. The newsprint industry clung to the belief that people would be flipping the pages of a tangible newspaper for eternity even as the world around it continued to become more and more digital. As an MBA two years removed from business school, I found Gharajedaghi’s five-level, hierarchical model an excellent, systems compliment to Porter’s business theories. Taken together, the two models effectively show that with success there’s always a risk of failure and offer the foresight to avert it. That’s not something many business school’s generally teach very well nowadays.